Is McDonald's Sitting on the Key to Its Recovery? With over 36,000 restaurants, some hedge funds think the burger palace has the means to engineer gains. 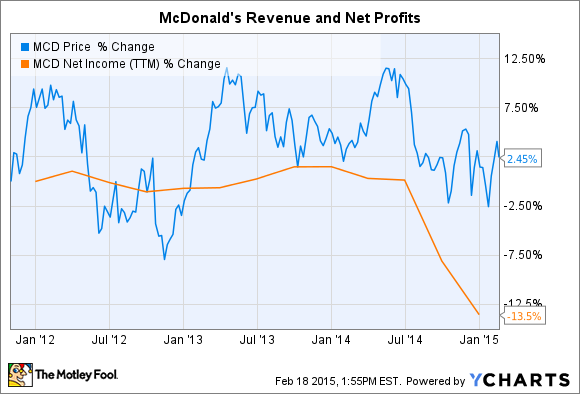 Is McDonald's (NYSE:MCD) simply too big for its britches? A hedge-fund operator seems to think so and suggests the burger chain use its real-estate portfolio as a means of unlocking value for shareholders and the restaurant itself. Glenview Capital Management recently revealed a small stake in McDonald's, but offered some big ideas on how the sprawling, 36,000-store chain could inject its stock with new vigor, including spinning off its properties into a publicly traded real estate investment trust (REIT) or franchising more of its restaurants. Another option includes the sale and leaseback of the restaurants, which involves selling the buildings and land they sit on, and then simultaneously leasing them back. Any of the ways could help the market more appropriately value the business, something investors would likely welcome as the stock currently trades where it did as far back as late 2011. Using McDonald's real estate as a lever to boost value is not a necessarily new idea as fellow hedge-fund operator Bill Ackman of Pershing Square is said to advocate just such a solution to the burger joint's woes, and such realty-based financial engineering is a favored tactic of activist investors. Darden Restaurants (NYSE:DRI) is actively considering a REIT for its far-flung real estate portfolio since hedge fund Starboard Value won its proxy fight against management last year and now controls the board of directors. Bob Evans Farms (NASDAQ:BOBE) had four dissident directors from Sandell Asset Management installed on its board last September and a REIT may be in the casual dining restaurant's future as a result. Alternatively, refranchising would follow the lead of McDonald's two burger rivals Wendy's (NASDAQ:WEN) and Burger King parent Restaurant Brands International (NYSE:QSR), which have sold to franchisees substantial portions of their company-owned assets, with Burger King refranchising virtually all of its restaurants. Of the 7,368 restaurants in its system at the end of last September, only 52 of them were company-owned. Wendy's is similarly slimming down. Earlier this month it announced it was refranchising 500 restaurants, keeping to its goal of having just 5% of the restaurants in its system remaining company-owned by 2016. Some 18% of McDonald's restaurants, or more than 6,700 of them, are still company-owned. Another tactic activists like, though it hasn't been mentioned yet as an option for McDonald's is the sale-leaseback arrangement, which can be a cheaper option than owning the real estate outright. Instead of being a landowner, which isn't the business they're really in -- particularly so for restaurants -- the companies become tenants, with the resulting capital freed up for use in the business. In fact, that's exactly what Darden did when it sold the Red Lobster chain and touched off the proxy battle with Starboard Capital. The restaurant operator sold the operating business of the seafood chain to Golden Gate Capital for $2.1 billion, and sold the real estate associated with it to American Realty Capital Properties. It was criticized for the move, though, because it ended up having to pay a half-billion dollars in taxes and transaction fees, meaning the net total realized from the deal amounted to selling the seafood chain for pennies on the dollar. Yet in the Red Lobster case, despite the criticism Darden's management received, it did use the proceeds of the sale to significantly reduce its debt load and though it needs to now pay rent, its financial position is much improved. Creating a REIT offers greater yields and tax benefits for the company and investors, though there are operating risks as well. Spinning off the property into a separately traded trust would offer some balance-sheet advantages, such as taking on a good portion of McDonald's debt, which could help boost its stock price, while also providing significant tax savings. Rules require REITs to distribute 90% of their income to their shareholders yet they aren't subject to income tax at the corporate level. This would allow the REIT to pay higher-than-average dividends, which would be an attractive option for income-seeking investors. McDonald's charges its franchisees rent, which is taxed, but under a REIT arrangement it would not be. And because of tax regulations, it would likely be the franchised restaurants that would be spun off to make the transaction tax-free to shareholders. Over the years McDonald's has considered going the REIT route, but rejected it each time saying it would a be a costly, time-consuming process that might not even qualify for the designation. In terms of sale and leaseback, costs are always rising and lease terms can be for as long as 20 years. The new rent and other expenses could reduce the amount of capital available to finance growth projects. Proponents counter, though, that such costs are usually less than the value lost by tying up the property in ownership. Sale-leasebacks also have some disadvantages including losing flexibility in using the property in the future and locking the company into the property until the lease expires. The company also forfeits any appreciation in the value of the property, and it could face a big rent hike in the future if the property value soars and the owner tries to adjust its rental value to match. Similarly, refranchising, while often seen as a bullish market indicator because it signals there are eager buyers, also limits a company's control over the franchisee. It ties the company's operating results to the franchisees, but leaves it dependent upon franchisees to also open new restaurants and implement changes. Company-owned stores can roll out new menu items or image enhancements immediately; franchised stores take a lot longer to accept and implement the changes. McDonald's collects 4% of a franchisee's gross sales as well as rent, which has historically been about 8.5% of monthly sales. That means for every Big Mac a franchisee sells, McDonald's gets about $0.14 from the transaction. It would have to weigh that against the loss of control. But completely separating all of a company's real estate, whether through refranchising, sale-leaseback arrangements, or spinning it off into a REIT, can be a mistake, too. Retaining some property is a good buffer for market downturns and is valuable collateral when renegotiating loans. In the end, while McDonald's might forgo getting rid of any of its restaurants, a half-measure of separating from at least some of its properties may be enough to meet the demands of all parties. Getting the conversation going may be the biggest benefit from the hedge-fund operator's small stake.